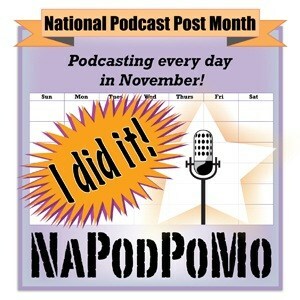 This is my third, and final, blog in my series about the Necromancer beta. 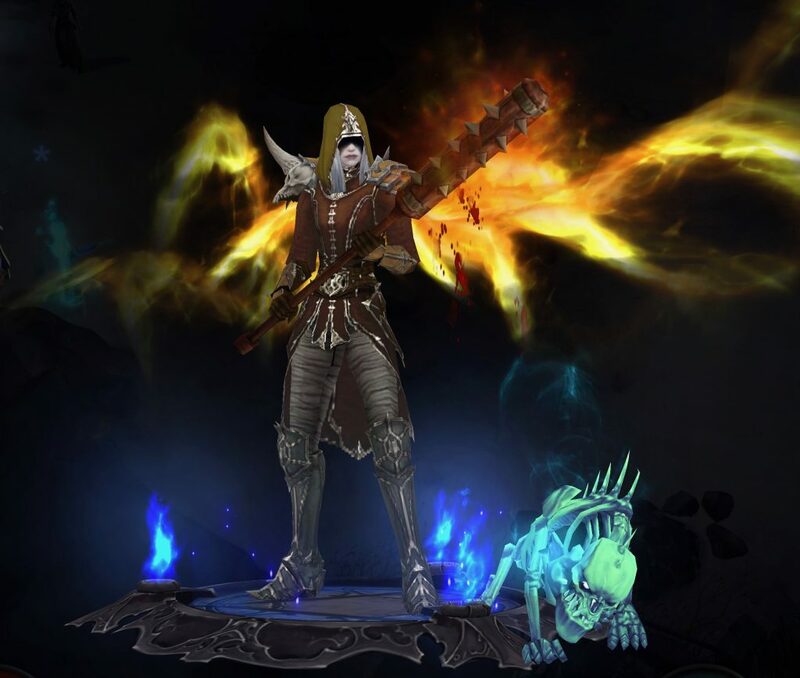 The Necromancer is a super fun class to play, and I had a good time trying it out. 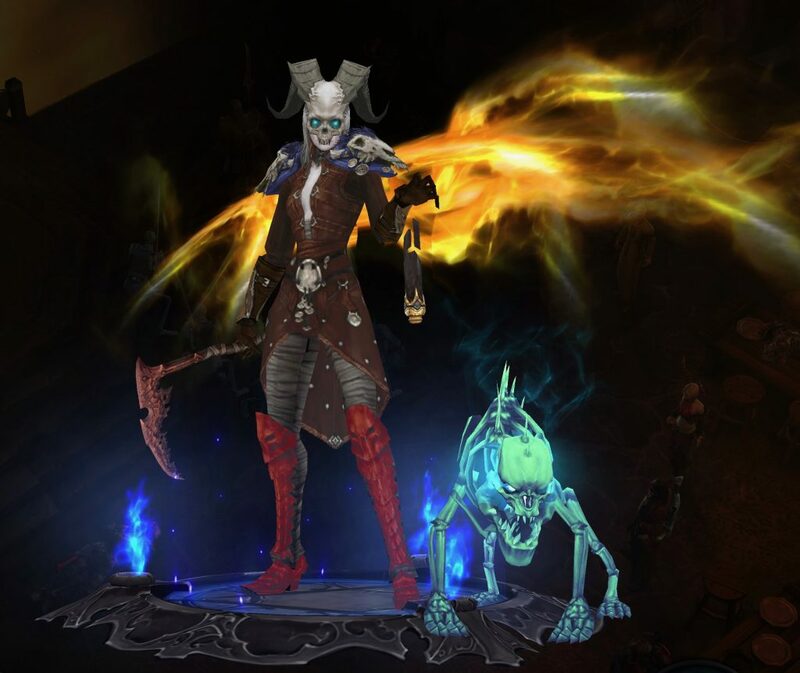 I never made it to Level 70, so I didn’t get to try out the Necromancer sets. Even so, right from the start, it felt like I got a satisfying amount of Skeletons and Golems to command. 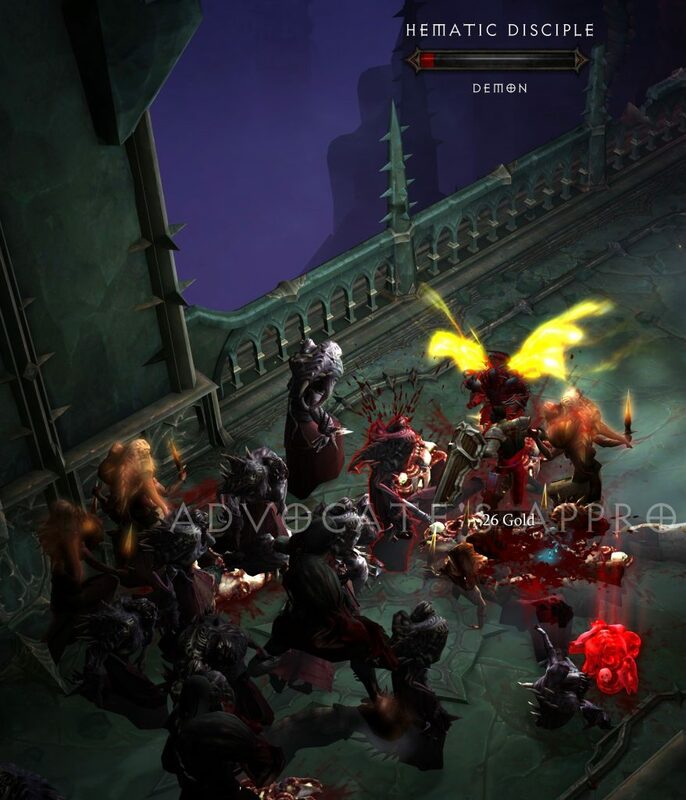 What you see in the screenshots in this blog might, or might not, change before the Necromancer Pack is launched. That’s the nature of a beta. 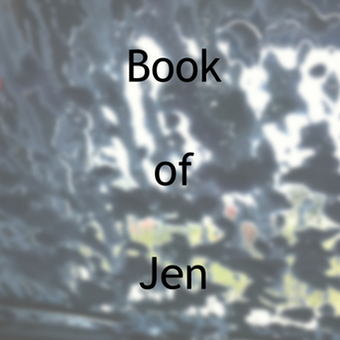 I find it exciting to see how things iterate before they go “live”. 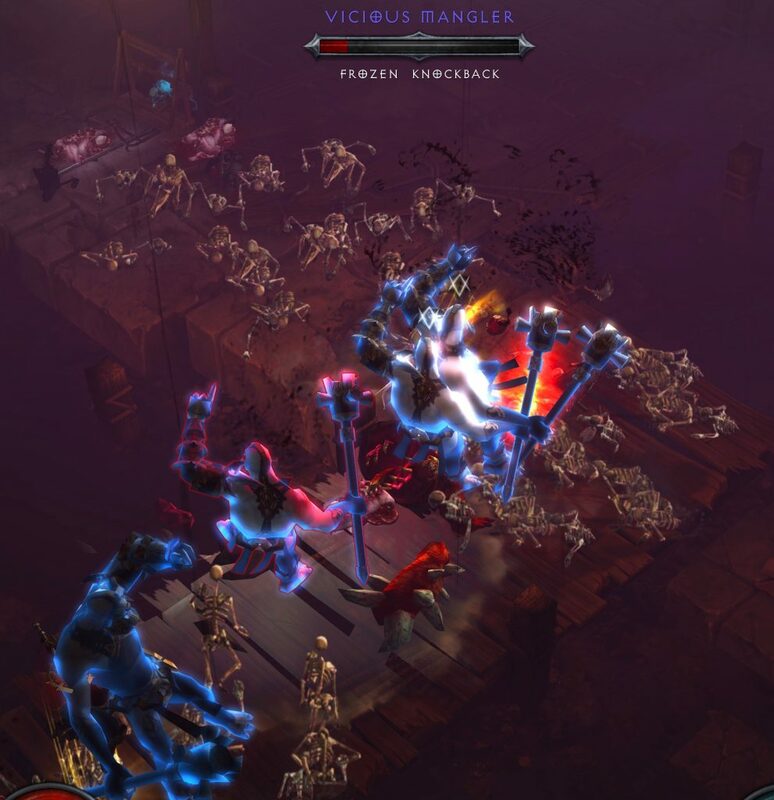 The majority of my time in the Necromancer beta was spent running Nephalem Rifts. To my delight, I found some monsters I’d never seen before. The area they were in looked new as well. I suspect they are part of the new content that was added in Patch 2.6.0, and not necessarily related to the Necromancer beta. 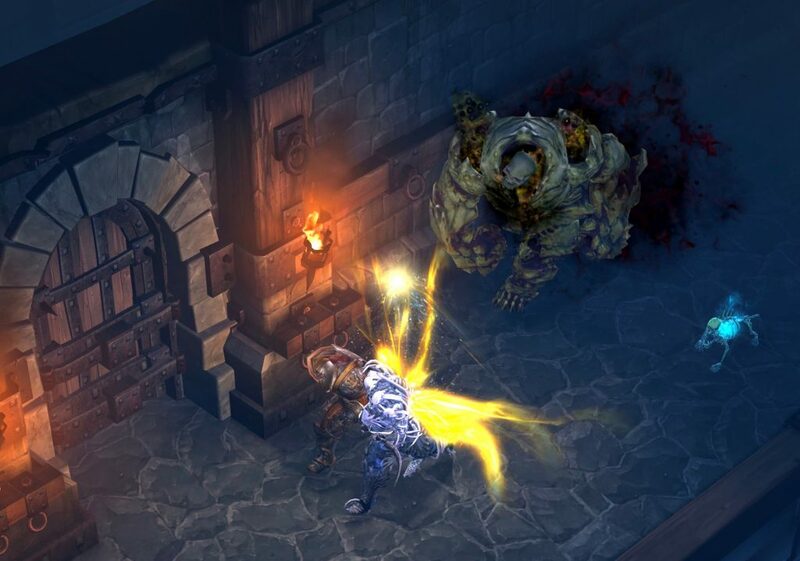 If so, then players who – for whatever reason – don’t want the Necromancer Pack – could potentially encounter these new monsters and areas after they download Patch 2.6.0. At the time I am writing this blog, I know absolutely nothing about the Wretched Host monsters. The word “Host”, in the contest of the Diablo “universe” seems ominous. Is this creature the vessel of a demon? Or, has this creature been infected with a parasite? A Journal about the Wretched Host (read to the player by Tyrael) doesn’t exactly answer my questions. Wretched Host: There is no end to the number of rituals these cultists will use to twist mortal flesh. Some call the process ascension, a lie that no doubt buys them obedience. But mark my words – these abominations have not ascended. They live only to suffer and hate until they meet their final death. – Archangel Tyrael. This screenshot shows a section of whatever this new area happens to be. There is a lot of detail in the artwork. I was impressed by the amount of detail in the artwork on the door, the doorway, and the wall above the doorway. Very ornate! They didn’t have to put intricate line work into the arch, add spikes above the doorway, or make such a dramatic door – but they took the time to do it anyway. 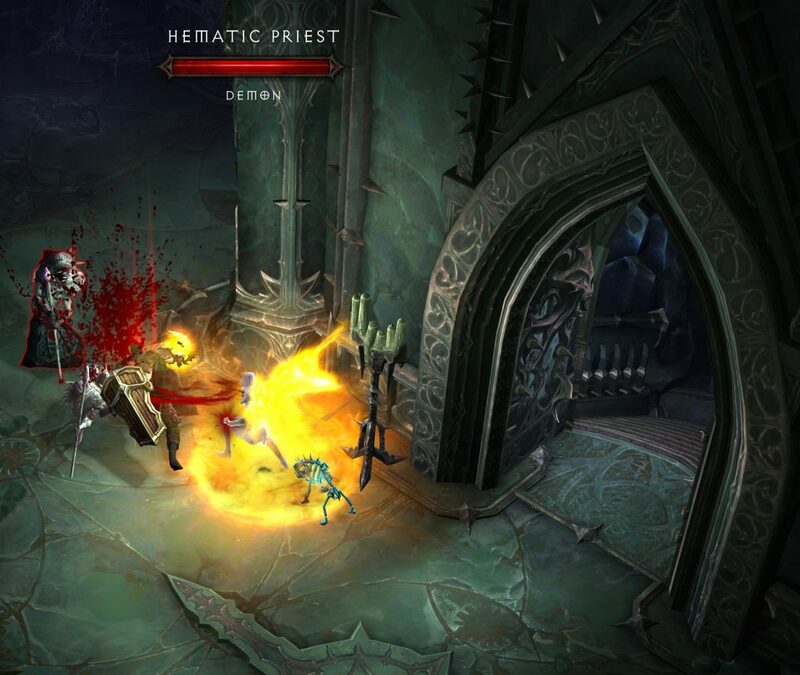 I’m constantly impressed by the gorgeous artwork in Diablo III. There is a huge statue in this little alcove. If you look closely, the figure has straps across her shoulders and chest that make a pentagram. My guess is that this sculpture is of a demon. If so, it’s a very graceful looking demon. This is an Ice Golem. It is one of the many types of Golems that the Necromancer can choose from. As with the other classes, the runes unlock additional types as the player levels up the character. Command Golem – Ice Golem: Command the Golem to the targeted location where it freezes enemies and increases their chance to be critically struck. 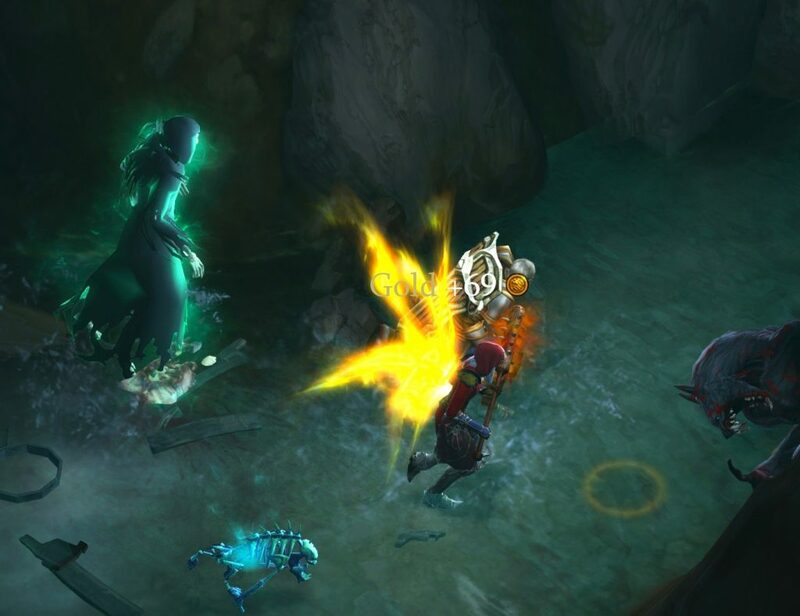 The Ice Golem is provides a “two-for-one” benefit to the Necromancer. 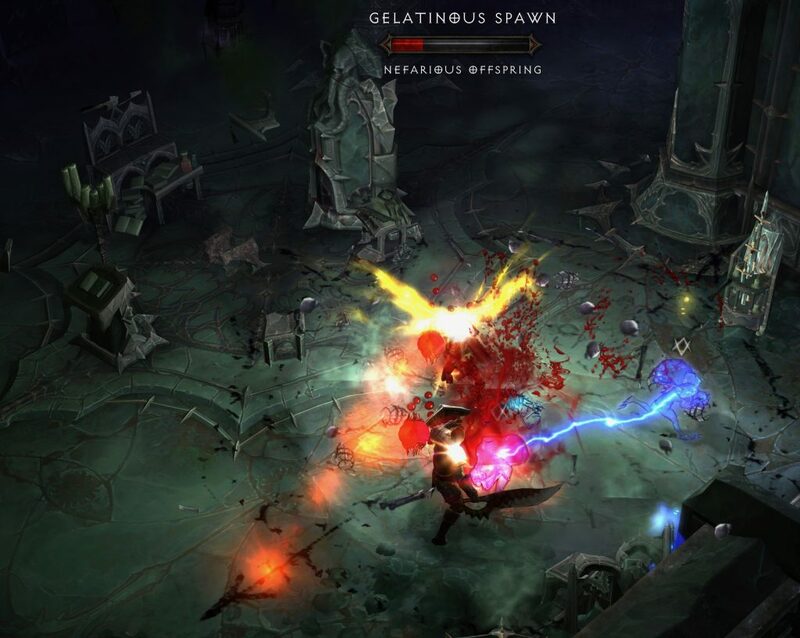 It freezes enemies – which prevents the enemies from attacking the Necromancer (for at least a little while). 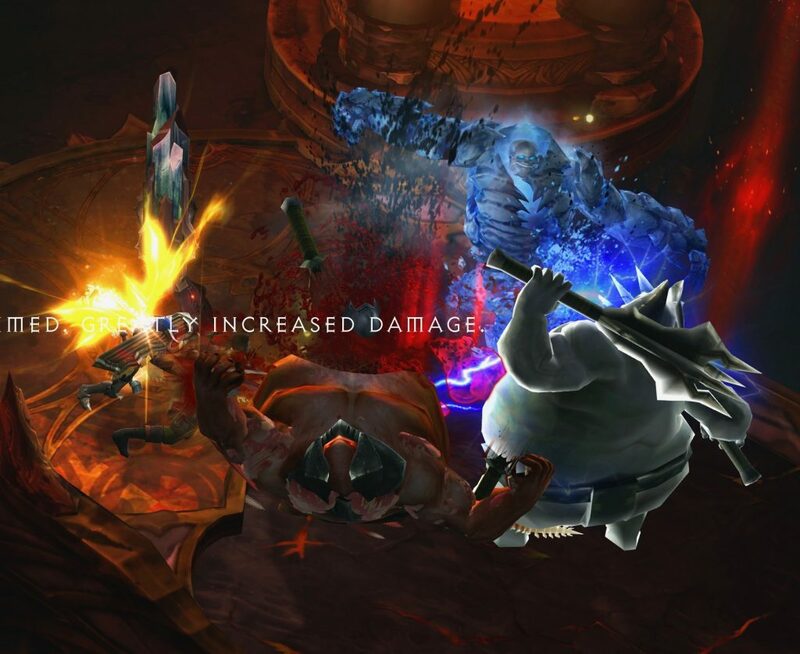 It increases the chance of the Necromancer getting a critical hit on the frozen enemies. In other words, it gives the Necromancer a chance of a critical hit in addition to whatever chance of crit is on the Necromancer’s gear. 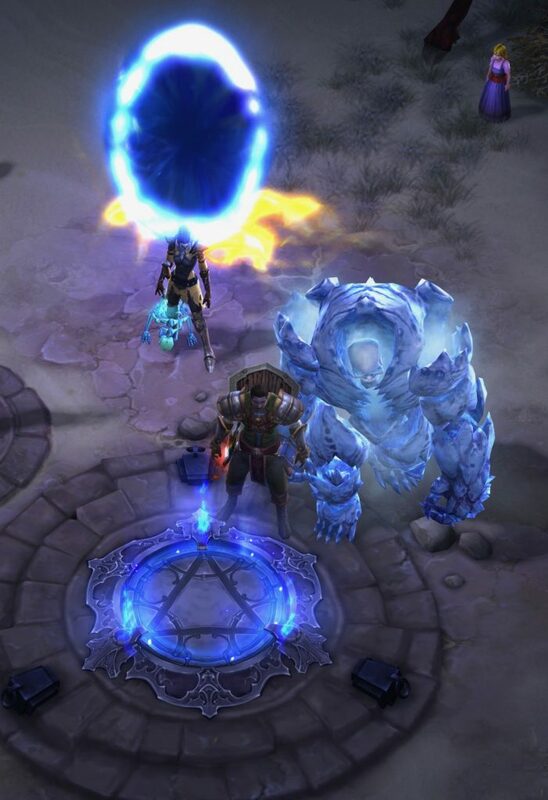 The Ice Golem is the prettiest Golem I got to use during the Necromancer beta. He might be the prettiest Golem of them all. 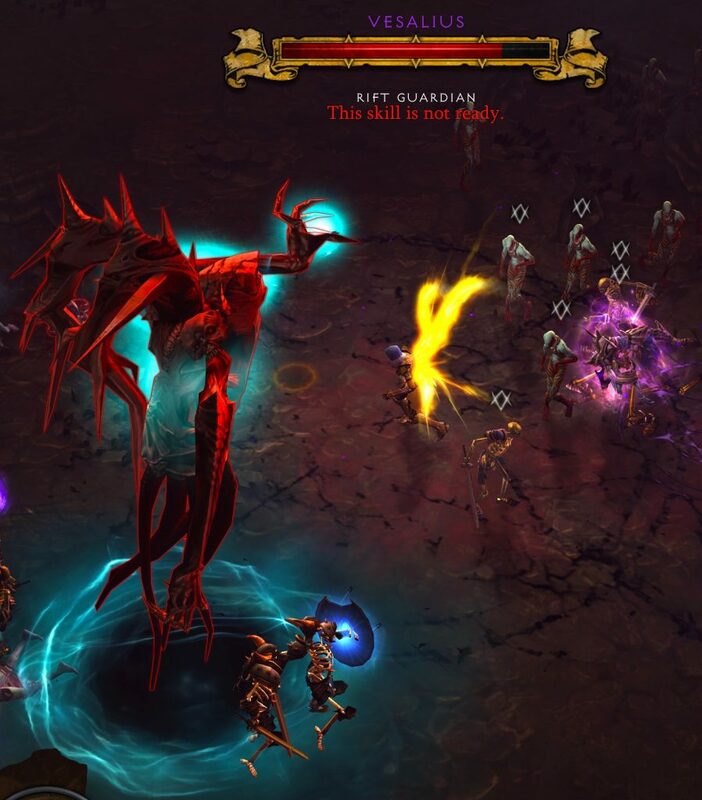 This screenshot gives you a really good size comparison between the Necromancer’s Golems and some of the larger Diablo III enemies. I think this is a brand new Rift Guardian! I certainly don’t recall fighting Vesalius before, and he isn’t included in the You’re Not the Boss of Me Achievement. Vesalius is a malformed mess. Here’s another look at Vesalius. My best guess is that he is part of the new stuff that was added as of Patch 2.6.0. The most exciting thing about the discovery of what I sincerely believe is a new Rift Guardian – is that there could be more new Rift Guardians out there, just waiting to be discovered. 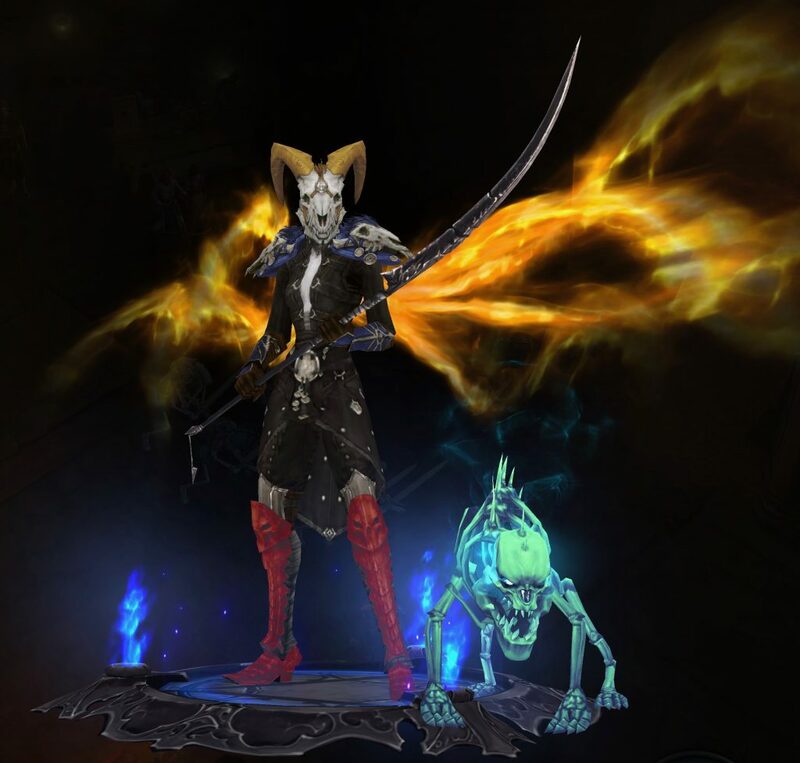 It would be nice to have some more variety in Rift Guardians. This huge Khazra-looking creature is Djank Mi’em the PTR Vendor. He is a merchant that will absolutely not end up in the “live” Necromancer Pack. 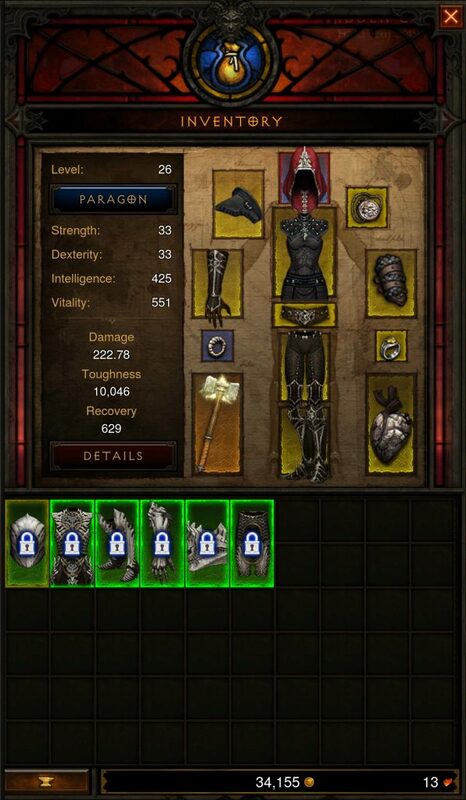 The entire purpose of this merchant was to give players an easy way to obtain Necromancer sets. I managed to gather enough Blood Shards to buy one Necromancer set. 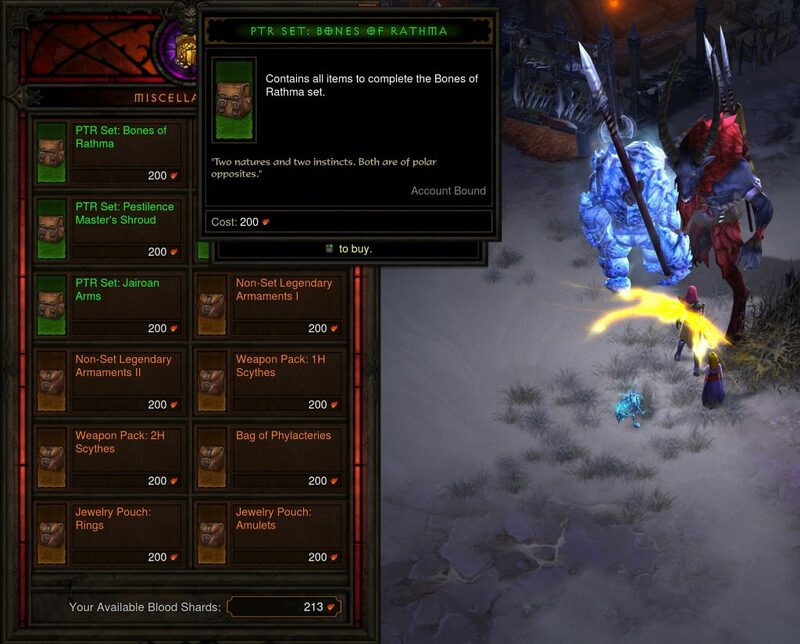 I selected the Bones of Rathma set, hoping that the ability to buy it meant I could use it (despite not having hit Level 70 yet). No such luck! The entire set sat in my stash, waiting for my Necromancer to grow big enough to use it. Oh, well. I’ll have something to look forward to after I get the Necromancer Pack. 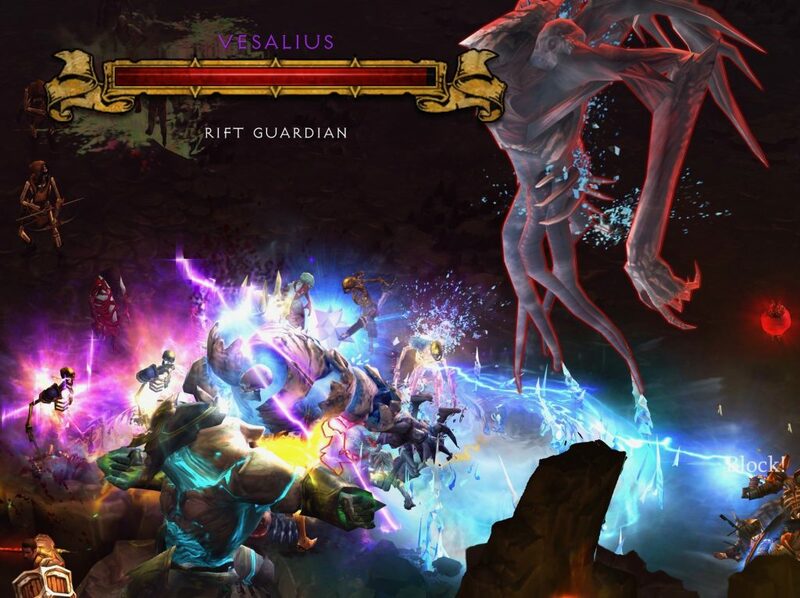 The following screenshots show new monsters that I ran into while running Nephalem Rifts. They were different from the new monsters that I posted screenshots of earlier in this blog. 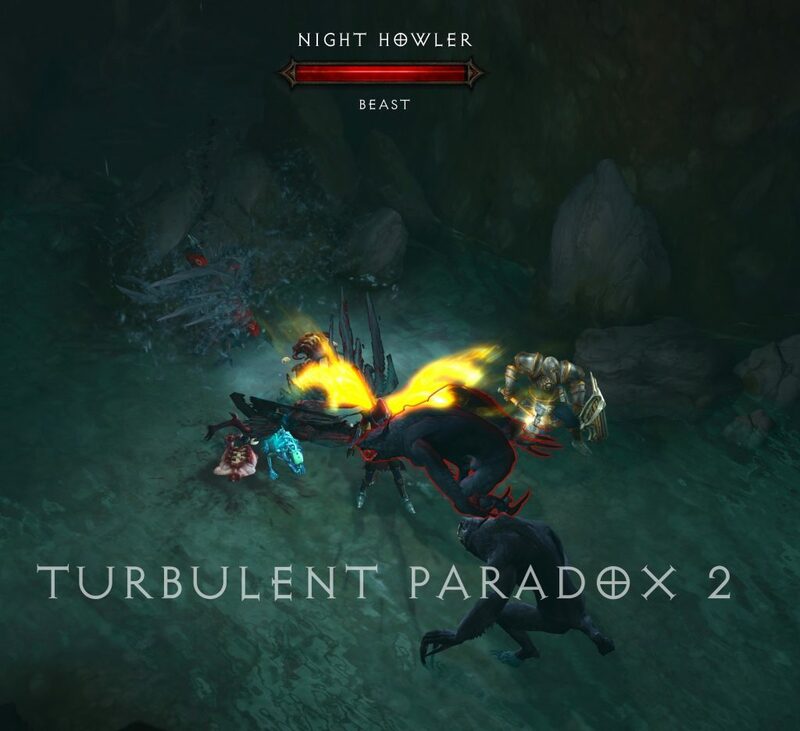 As I was fighting the Night Howler, (and the other new monsters that resemble it) my first impression was that they looked like werewolves. 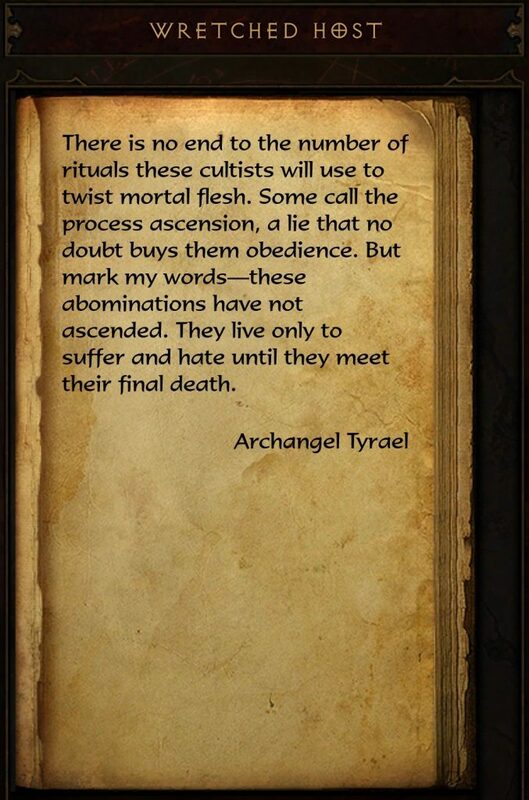 A Journal, again narrated by Tyrael, confirmed my suspicion. 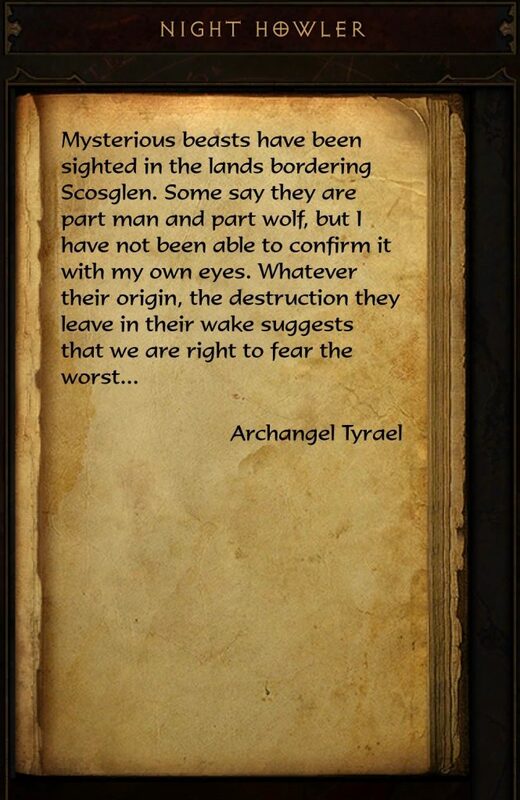 Night Howler: Mysterious beasts have been sighted in the lands bordering Scosglen. Some say they are part man and part wolf, but I have not been able to confirm it with my own eyes. Whatever their origin, the destruction they leave in their wake suggests that we are right to fear the worst… – Archangel Tyrael. This is a Skeletal Mage – one of the other minions the Necromancer can command. I love how creepy it looks, but I did not find it to be especially effective. I figure it becomes stronger as the Necromancer levels up, and I would be wiling to give the Skeletal Mage another try after I get the Necromancer Pack. Catrina the Necromancer at Level 33. She has fancy striped pants. 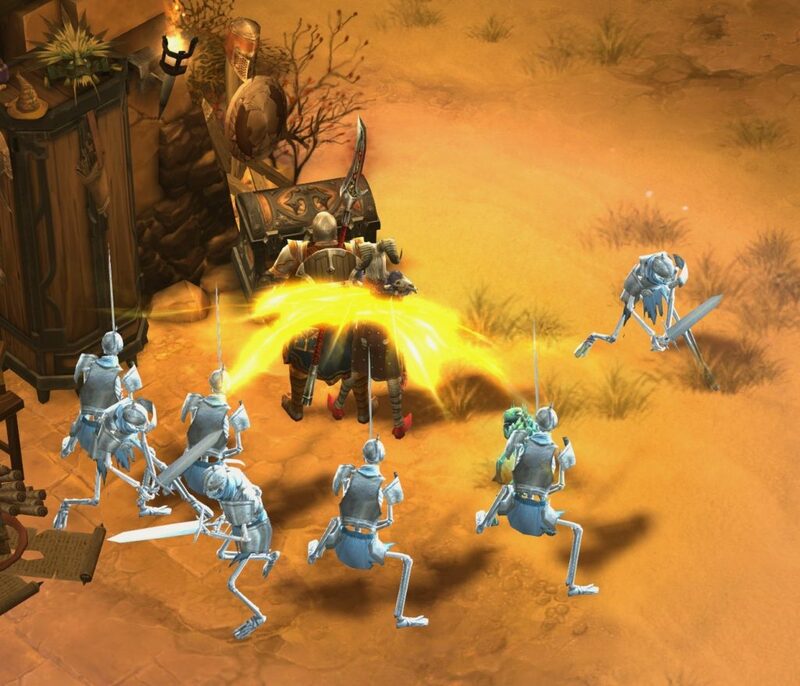 One more screenshot of the Army of the Dead skill! This “flash mob/mosh pit” of Skeletons is probably my favorite Necromancer skill. Its exciting to watch a wave a Skeletons rush in and attack something! That being said, I also like the Syphon Blood skill that enables the Necromancer to literally syphon blood out of an enemy and use it to regain health for himself/herself. 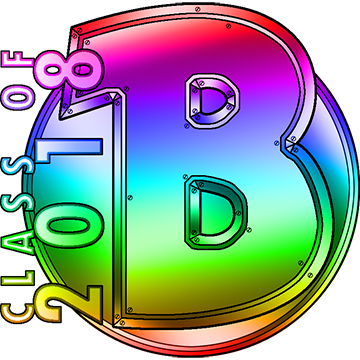 (As someone who struggles with borderline anemia – I would like to be able to use that spell in real life.) None of my screenshots of the Syphon Blood skill came out well, so I didn’t have any to put here. 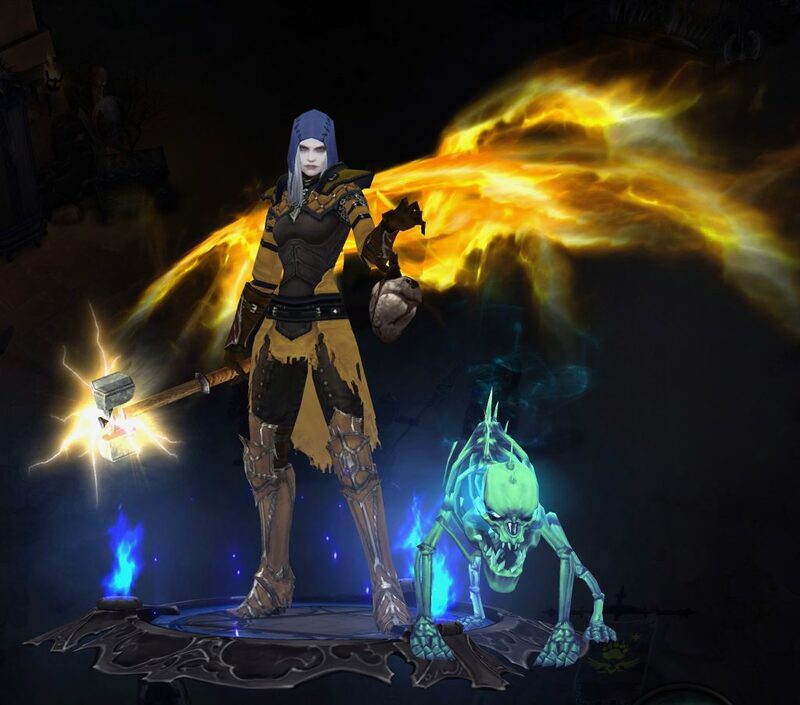 Catrina the Necromancer at Level 35. She found blood red boots. Another screenshot of the Command Skeletons. They are protecting the Necromancer’s stash of loot. 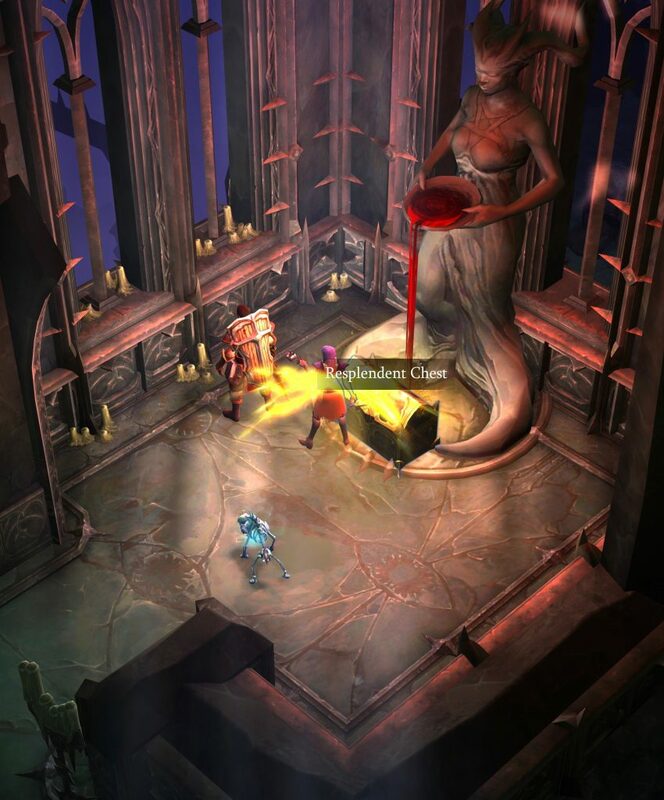 Catrina the Necromancer at Level 42. Her helmet looks like it once was a demon’s skull. 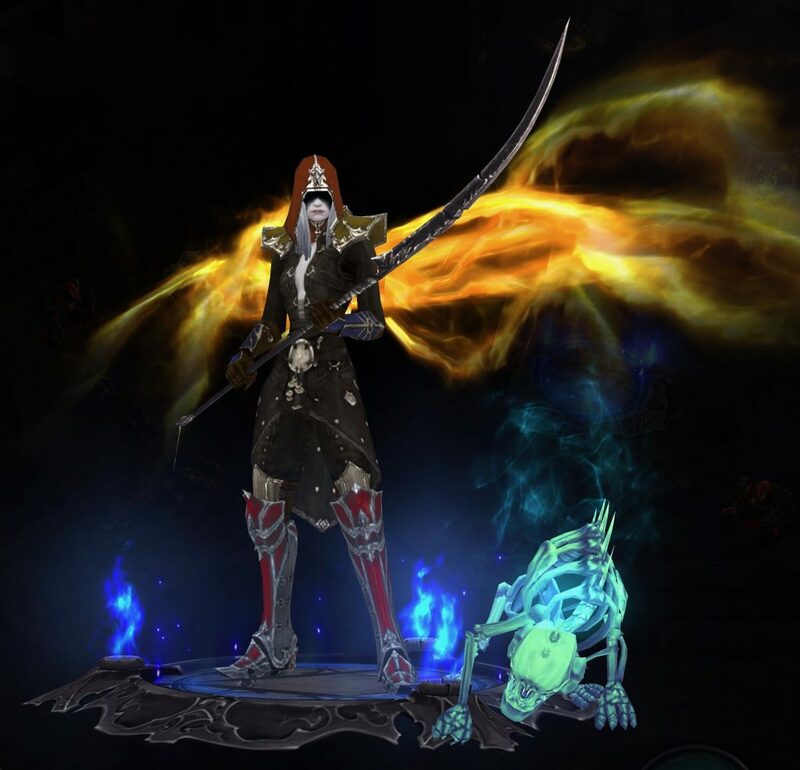 Catrina the Necromancer at Level 44. She’s got a helmet that looks like the skull of a goat. The Decay Golem is rotting away. His toes and skull are little more than bone. He doesn’t seem bothered by this at all. I would have like to have had more time to see what the Decay Golem can do, but the Necromancer beta ended before I got much of an opportunity to use him. I’ll have to explore the potential of the Decay Golem after I buy the Necromancer Pack. Command Golem – Decay Golem: Active: The Golem consumes corpses at the targeted location increasing its damage for each corpse consumed. It seems to me that the way to use the Decay Golem is to kill a bunch of “trash” monsters, and then have the Decay Golem consume the corpses shortly before sending him to fight a blue or gold monster. 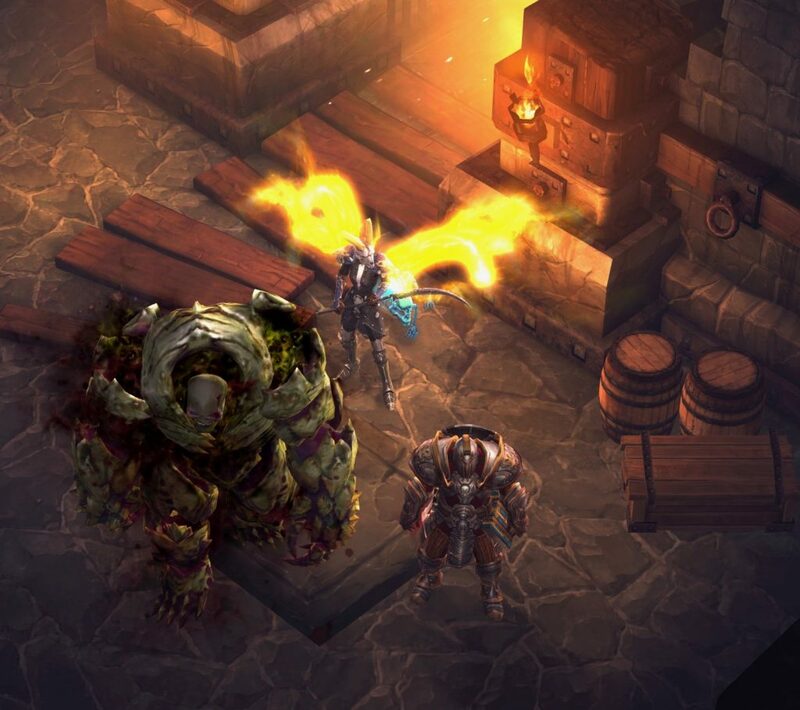 The Decay Golem will be stronger after consuming corpses, and that might make it quicker for the player to kill difficult monsters. 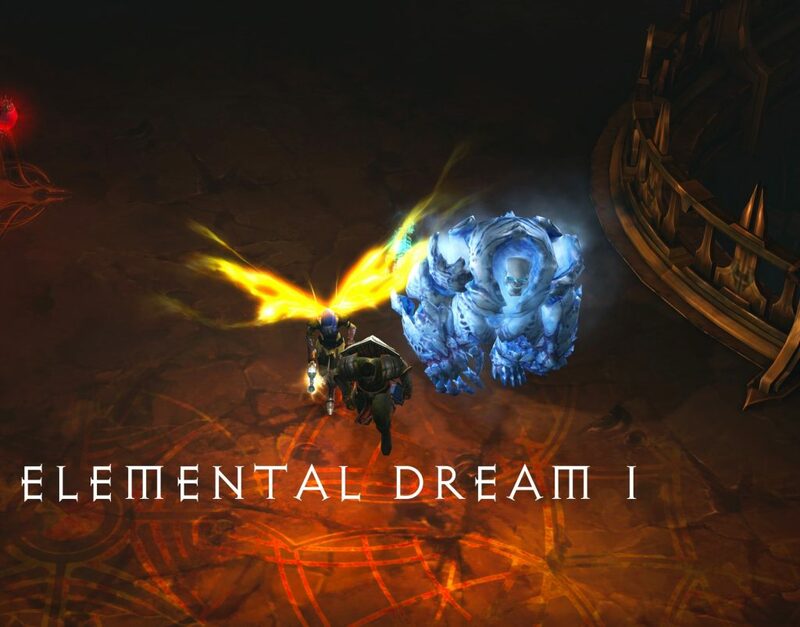 I think the Decay Golem might be a good thing to use in a Greater Rift. The Decay Golem appears to run around in his own cloud of stink. 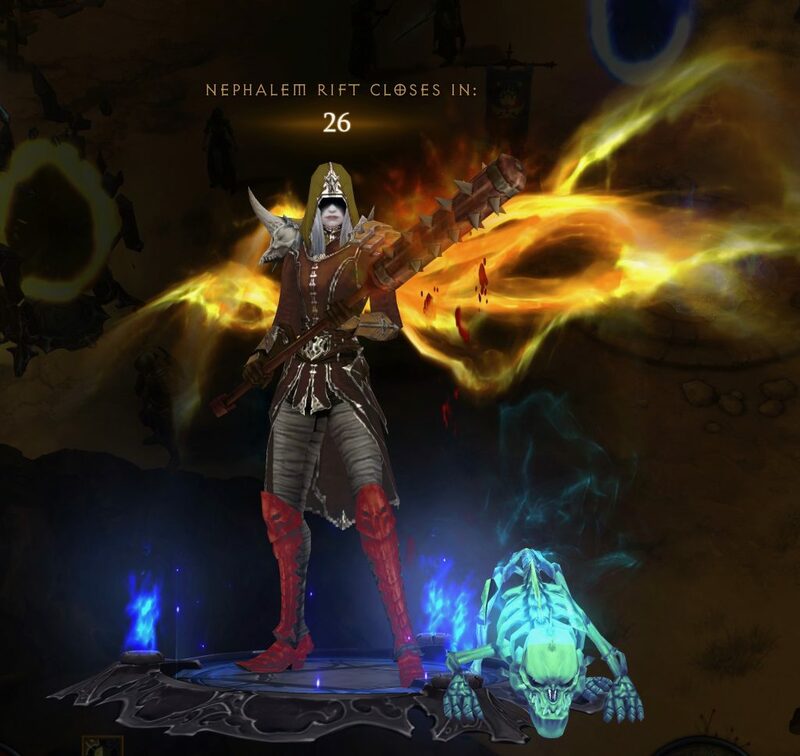 I got my Necromancer to Level 52 before the Necromancer beta ended. 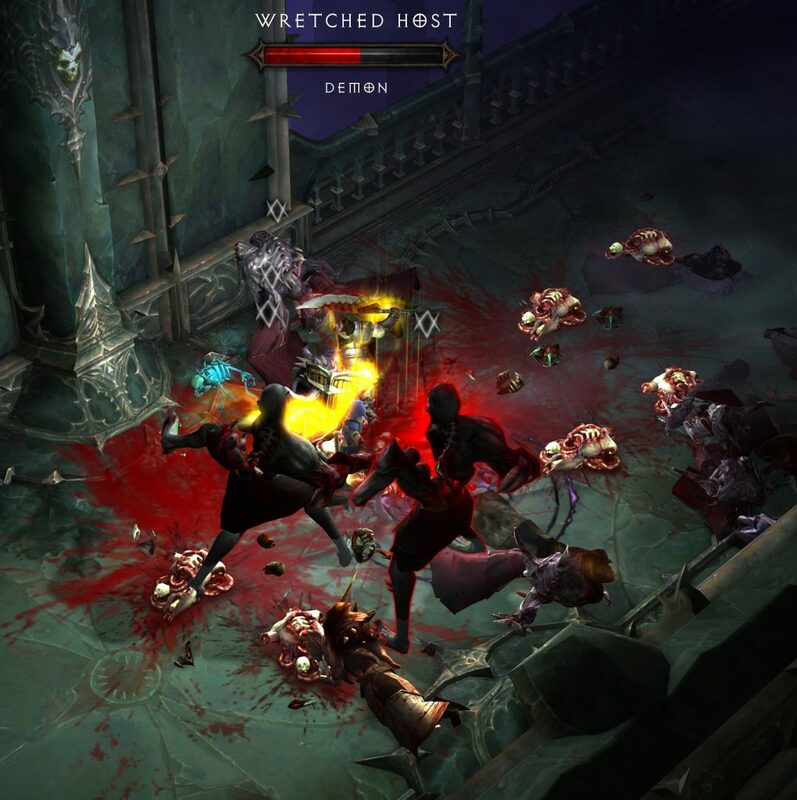 My overall impression is that the Necromancer wasn’t difficult to level – I just needed more time to play. The Necromancer class has a lot of unique skills with runes that do interesting things. To me, it seems like this class has a wide variety of potential playing styles. I look forward to the Necromancer Pack!